Peace yall. Here we are. We are entering the last month of this incredible year. 2014 was very good to me. 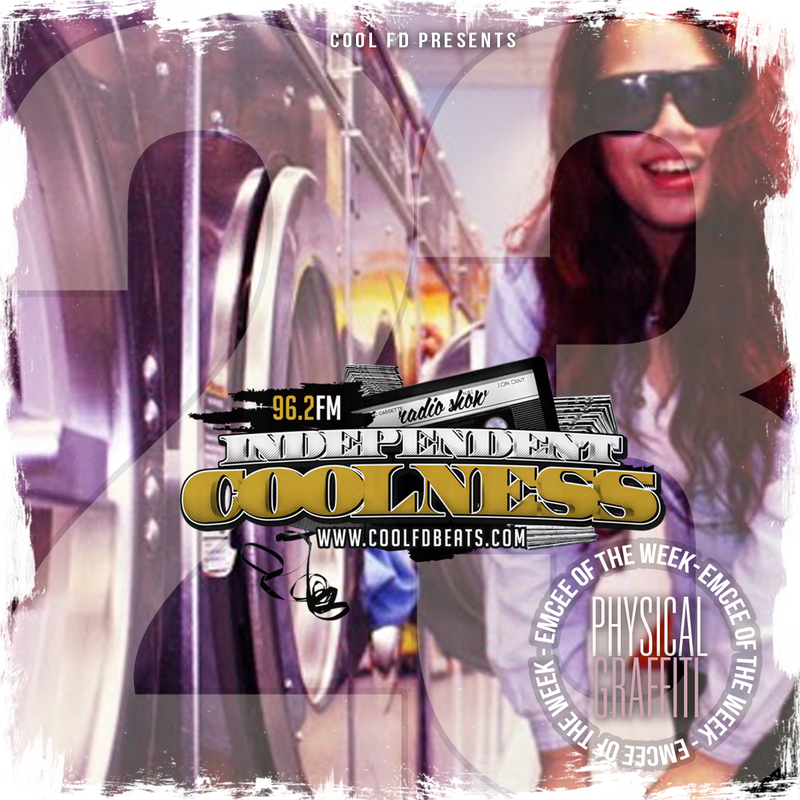 It gave me the opportunity to start this Independent Coolness radio show. I’ve been through some real thoughts about my music career thanks to this radio grind. I just want to say thank you to you all : the listeners, the supporters, the downloaders, the haters, and of course the artists. This show is yours. Keep struggling queens and kings. This show features my girl Physical Graffiti as Emcee Of The Week. I was not that familiar with her work until then, but i’m more than convinced she got what it takes to shine more and more in this independent hiphop game. And she got my full support. What I have to improve : like my man J Rizzle said, I have to find new ways to reach more listeners. The radio has this incredible power to connect the people, to enlight the talents, to spread the untold truth. That’s why I will keep the real radio grind on, no matter how hard life tries to knock me. My radioshow is dedicated to all my independent hiphop artists strugglin hard in the real life arena. You remember my homie Cee ? Yeah Cee from TMF, with who I recently just the refreshing joint « Be Healthy 2014 ». This real emcee didn’t came alone from his Australia, his brother went to Canada too, and is also definitely here to build his own legend. I’m talking about Notion, emcee / producer, mad talented and recently responsible for the dropping of a hot album : « Pride on my Cufflinks ». 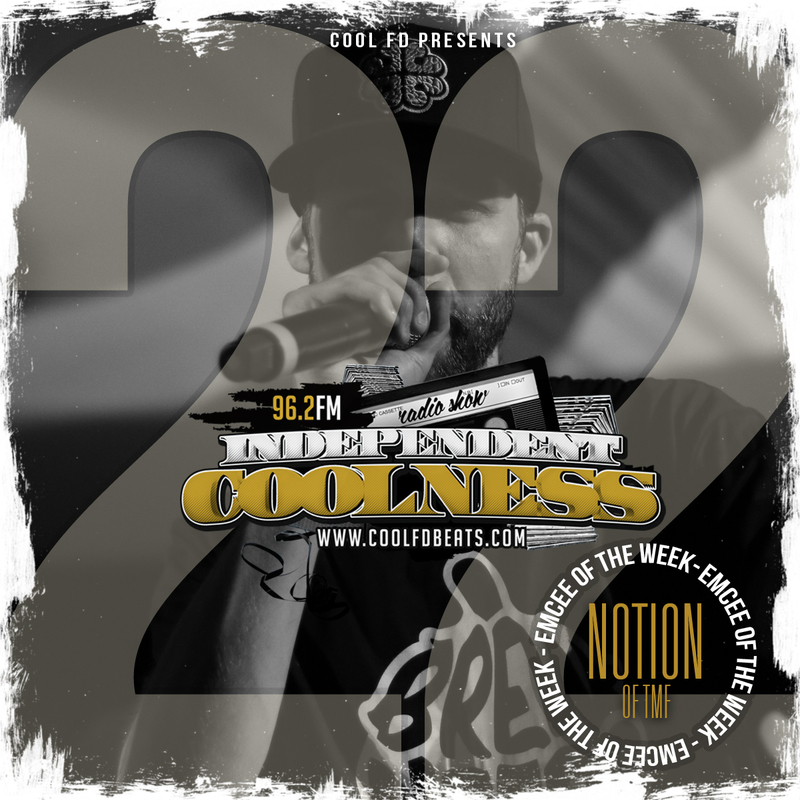 Yeah you guess it, Notion was my Emcee Of The Week for this 22nd episode. I will never thank enough my homie J Rizzle from Definition Of Fresh for this incredible connection. What I like the most during this episode : i’m not here to play the same very dope tracks recently released. Of course I like them. But come on, my purpose is to boost my independent fellows. So as you can see, my playlist does not make appear famous underground big names. Independent HipHop worth it. What I can improve : anticipation ! I’m telling yall, you don’t really wanna know the level of stress I go through when 2 hours before each show, I’m still ain’t done with the selection. Lol. I will make it better I promise. Beyond the fame, beyond the numbers, beyond the sales and the likes, I truly believe that the number one purpose of an artist is to testify, to watch and observe, to denounce and to claim the truth when everything around seems to lock it down … or to shot it down to be precise. The last night events in Ferguson make me sick. And stronger at the same time. I’m more than ever sure that our duty is to spread the truth, to be the people’s voice. 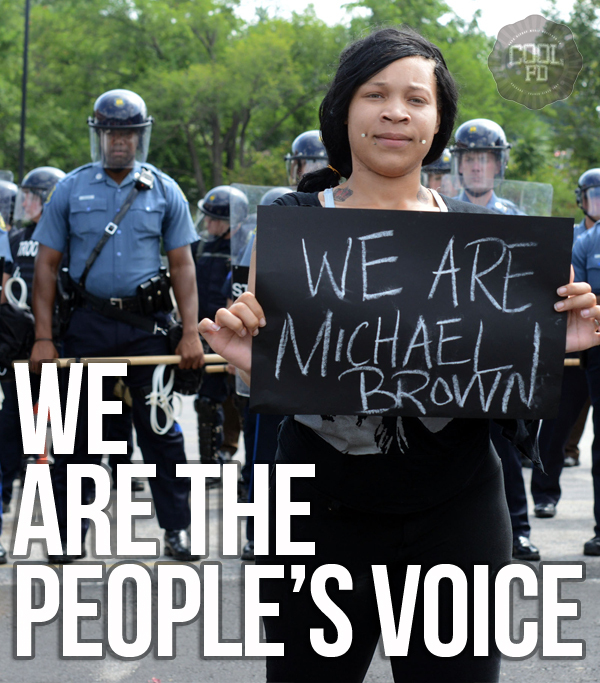 never forget one thing : We are the people’s voice. I can’t count how many times I told these words to myself : « this Internet game speeds up way too much the independent music grind ». I couldn’t be able to name all the artists that I’ve seen grinding for months, then release their album and be put out of the radars three weeks after. To make it clear, there is so much artists and so much releases every day that your new single dropped today will be considered as old one the day after … unless you do not accept it ! Why deciding to impose your own rythm ? You put your heart in your music (time and money included), your message is sincere and does not lose quality with time, and the Internet permits you to reach new fans everyday that still haven’t a single note of your creations yet : this is at least three reasons to refuse to follow the pace. Now we agree, how to make it a reality ? How to really control the life time of this precise song from your discography that deserves to be pushed and pushed again ? Put different timings in your release, depending on the different audiences you can reach : why not sharing your brand new track with your close friends and family first ? Then the bloggers and radios you like working with and, at then end, to your whole email list ? I personnaly have a groups of contacts named « influencers » with who I like to share first and talk about my releases. Re invent the song : the track has been released weeks ago ? Perfect ! Build a remix of it, by changing the beat with working a new producer, or by inviting emcees you appreciate to make an extended version of it. Such a move will give a new life to both tracks, the old and the new one ! For instance, Macabeats and me just dropped « The Fix Remix ». DJ Grazzhoppa, who made the cuts on the original track, published a post talkin about the new remix and the original track at the same time. Create the buzz around it : by building a remix contest, you keep the artists’ attention on your work. We all know that artists are the foundation of other artists’ fan base. This cool strategy has been just used by my bros from EMS (M-Dot and Revalation) who recently opened a remix contest in collaboration with KevinNottingham.Com. 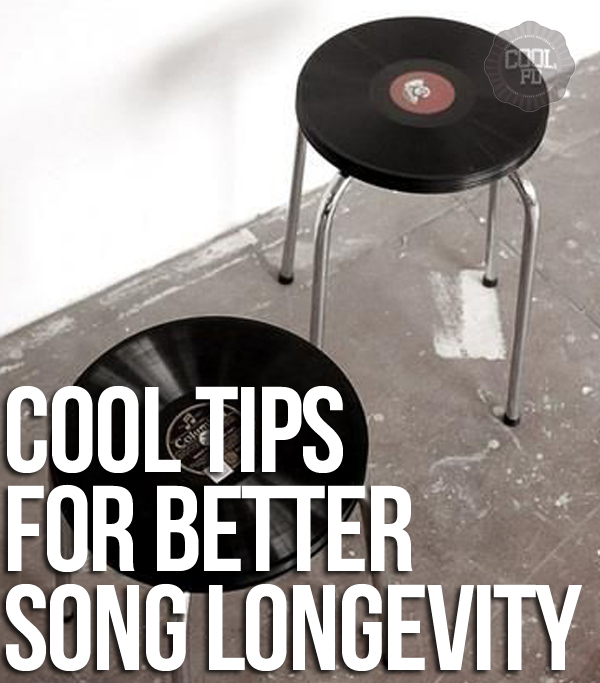 Never forget the lyrics … : many ways exist to use the lyrics to promote a joint. Of course RapGenius.Com is a must. Bandcamp also offers good option around the lyrics. I immediatly appreciate how Devine Carama used it for his album « Believing In Forever » .. and I mentionned this in my Cool Review of his album. … Nor the production : ask the producer to make a cool visual of his beatmaking experience of the track, this will give new angles to the track. My brother Big Malk does it well, feel free to holla at him ! Some insides about studio life ? Yes ! This could permit your fans to see where, how, with who you did the tracks. Could it be before or after the release, this is always a cool content to use anytime. My brothers Eddie Brock and Sincere recently did it for their upcoming collaboration in early 2015. From the bars to the stores : have you ever think about printing your favorite bars of the song on a shirt ? My brothers Cee and Notion from The Movement Fam did it, check it out. Ask an influencer from another domain to review your track : to be honest with yall, I had this idea while writing it ;) So I promise to try it ! Another ideas ? Suggestions ? Feel free to comment, share the knowledge, and of course holla at me on Twitter or Facebook !